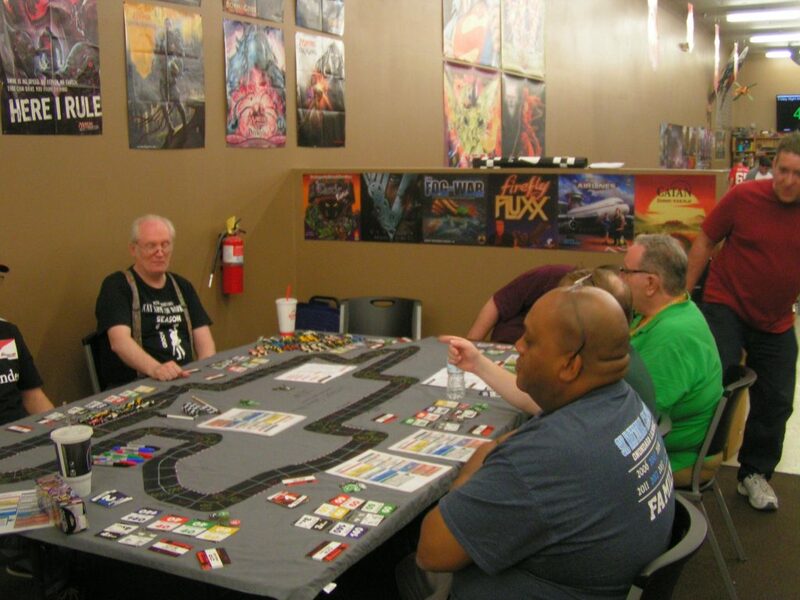 On June 9, eight aficionados of the new Championship Formula Racing game gathered at RIW Hobbies & Games in Livonia, Michigan, to race the downtown Detroit Grand Prix. I just finished painting the track a couple of days before the race. 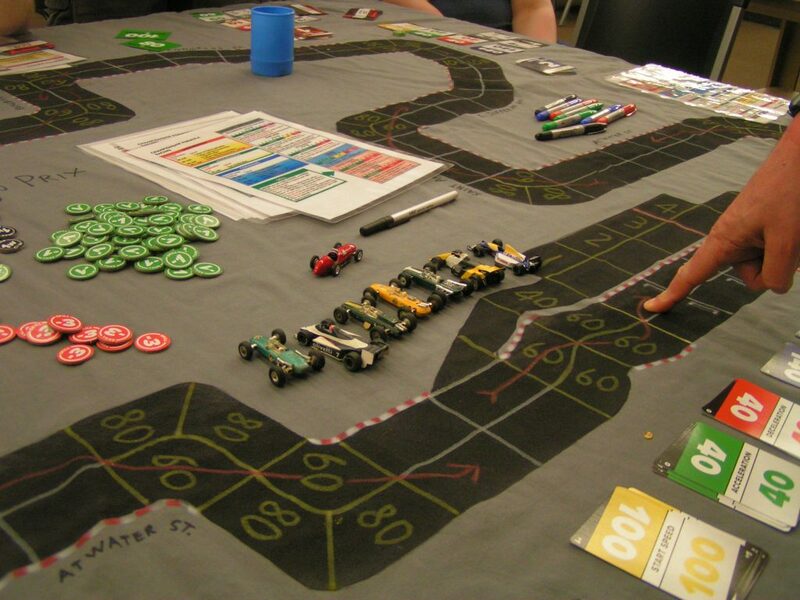 We (actually, Richard White) used to have a large scale downtown Detroit track, but it was stolen from him at a game con a number of years ago. 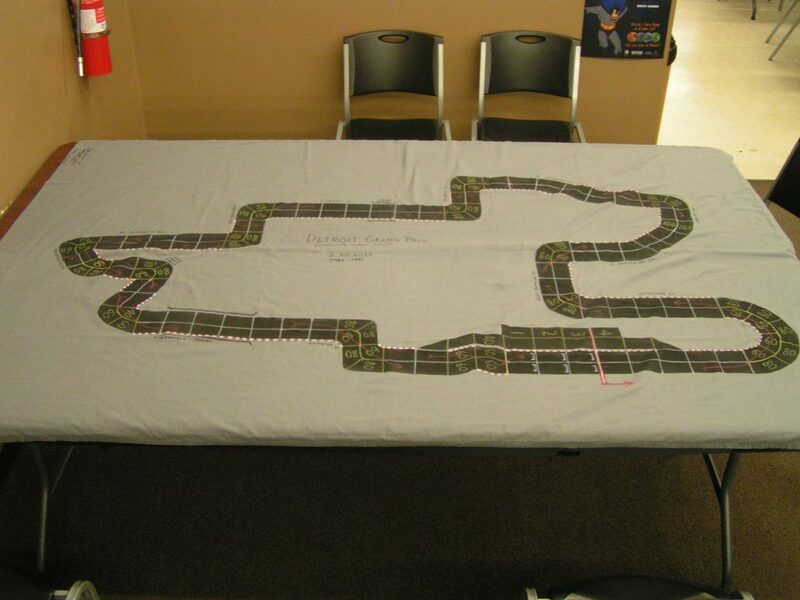 Detroit (downtown) Grand Prix track, painted on a flat bedsheet. 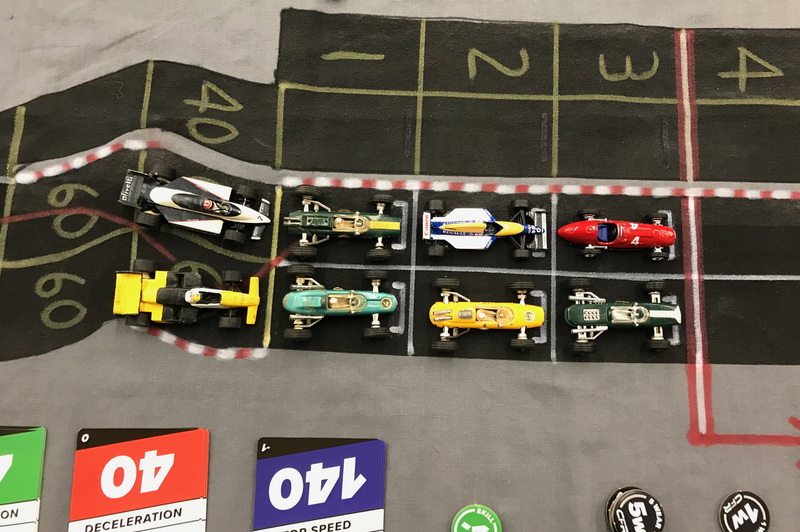 Actually, there were seven of us ready to race, we had bid for starting positions and had lined up on the grid, and then Russ Herschler finally showed up at the last minute, so he got to start in the 8th (last) starting position on the grid. Jack Beckman and I had given some new folks to the game some instruction, and helped them configure their car specifications before we bid for starting position. The racers are ready to start the Detroit Grand Prix. An overhead view of the starting grid. Jack’s red Ferrari leads into the turn onto Atwater St, just before entering the Goodyear Tunnel. Richard’s car collection are all parked to the left of the track. Unfortunately for Jack, his car was the first to run out of Wear, and he eventually crashed out of the race. Surprisingly, he was the only car to not finish the race. When the race was over, Jim Robinson took the checkered flag, Richard White was 2nd, and Garry Kaluzny was 3rd. It was a good race to help teach the rules, and even Richard White, who had a lot of previous experience playing Advanced Speed Circuit, learned the differences in rules between Advanced Speed Circuit and Championship Formula Racing. The finishing order of the Detroit Grand Prix. Jim Robinson’s car is at the left. It was also cool to see Richard White’s Formula One car collection again. 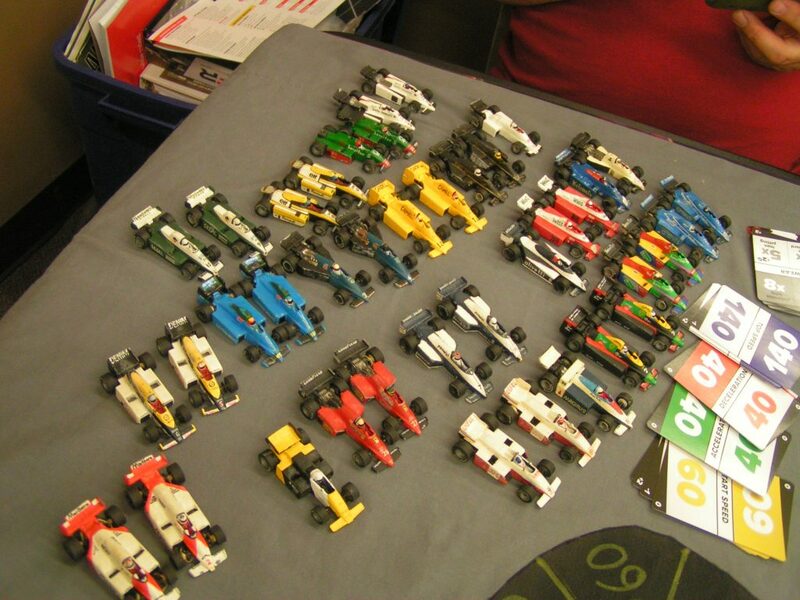 Richard White’s 1:64 scale F1 cars. Richard’s collection is all the more remarkable because his cars were all hand-modified and hand-painted from stock Hot Wheels cars, back in the 1980s when you couldn’t buy “collectible” cars anywhere, much less over the Internet (as there was no Internet then). 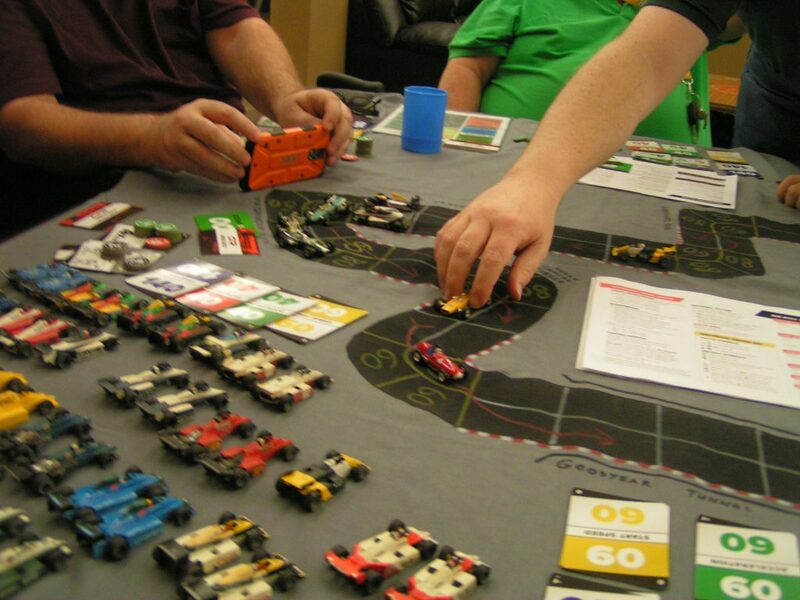 We will have more Championship Formula Racing demo races on Saturday, July 1 at the Canton Public Library and at Warriors 3 in Wayne, Michigan, and on Friday, July 7 at Imperium Games (formerly Flat Land Games) in Wixom, Michigan. Come on out and join us!